graduated from the University of Toronto with a Bachelor of Music in Performance degree in 1987. He has been a professional musician for 30 years and has performed around the globe including Canada (coast-to-coast), Mexico, the Dominican Republic & Abu Dhabi. His main instruments are violin and viola (acoustic & electric) and piano. He is also noted as a music arranger, composer & conductor. Ross performs many styles of music - including classical, jazz, pop, rock, blues, Celtic, Latin, new age, original, seasonal, etc. - in several different ensembles, bands and tribute stage shows. Ross teaches privately, along with his wife, violinist Angela Cox-Daly, and is the co-founder and director of Daly Music Academy (DMA). Both Ross and Angela enjoy adjudicating at various music festivals across the country. 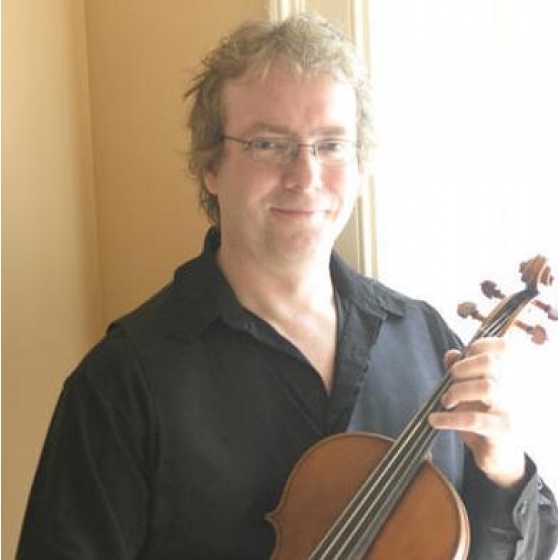 Ross is the President of Daly Live Music & Entertainment (DLME), Ovation Symphonic Productions (OSP), and is the Vice President of the Central Ontario Musicians' Association (Canadian Federation of Musicians). Ross has recently been certified as a Personal Trainer and Nutrition & Weight Loss Specialist. He offers unique fitness training programs which are specifically designed to increase your strength, endurance, and flexibility, and will assist in injury prevention - on and off the job. The nutrition component will also help you meet or exceed your weight loss goals! For more information see Daly Fitness. DLME provides the best in live music and entertainment - locally and globally! OSP committed to creating shows your audience loves by providing the highest quality live entertainment "Powered by Your Symphony Orchestra! Our shows appeal to broad audiences and are designed to be artistically and commercially successful. It's so easy: Simply Add Orchestra! DMA provides quality music education for the young and young-at-heart, from beginners to very advanced! We specialize in violin, viola, piano and theory and teach all styles of music. We inspire our students to reach their highest potential by offering private lessons, recital performance opportunities, master classes, music festival (e.g. Kiwanis) and Royal Conservatory of Music (RCM) examination preparation. Daly Fitness: Helping people reach their fitness, nutrition and weight loss goals with personalized resistance, cardio & flexibility training programs and nutrition plans. "I am always looking to expand my performance, teaching, orchestration and business opportunities and look forward to working with and performing for You!"